BALANCE, the newly launched festival concept devoted to Club / Culture continues with a varied programme of community-focused promoters and the Copenhagen-based agency, FAST FORWARD. Actively engaging with and supporting local acts, Fast Forward has developed a unique approach to cultivating a new generation of politically-minded and engaged audiences through their programming and productions. BALANCE is a project inspired by the shifting and diverse Club Cultural landscape and will attempt to expose unique approaches and developments within local and international scenes. With the inaugural festival being held in late 2017, Balance will give you a glimpse into its programme with a series of pre-festival events hosted by IfZ in the coming year; showcasing crews and collectives from various cities, transported to IfZ. Various producers, DJs, musicians and visual performers have nurtured FAST FORWARD since its beginnings in 2015. 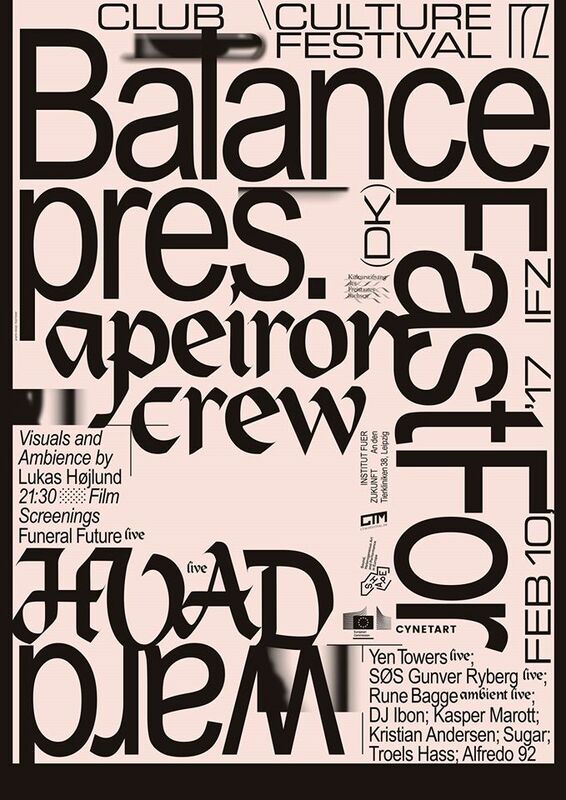 With Copenhagen nightlife progressively losing its affiliation with local artists, Fast Forward developed out of necessity; with events held in DIY spaces such as the the 2nd generation of the Ungdomshuset, Fast Forward bonds together social groups that might otherwise not engage with one another.